OMG! Check out this Raffle…. we mean, raffles! While at the Artastic Market on Friday (11-230 PM), be sure to buy a raffle basket ticket or ten. Advance raffle basket sales can be made in the office this week. 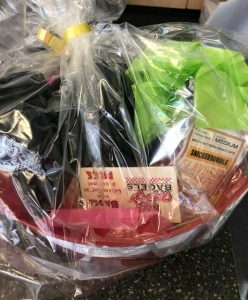 Due to the immense generosity of our vendors and supporters, this year we will have two amazing raffle baskets and we will also be offering a door prize from Big Daddy Bagels just for filling out our questionnaire This sumptuous door prize includes coffee, coupons, gift certs, swag and membership to the Big Daddy’s Coffee Club. Buy a chance at winning both raffle baskets for $8 or buy a chance at winning one raffle basket for $5. Enter as often as you wish. The more entries, the better your odds of winning. Raffle ticket sales start tomorrow! Can’t make it to the event but would like a chance to win? Purchase your raffle ticket in advance with Hope! Raffle Basket winners will be notified via email. A personal voice lesson offered by Katie Wise. All ages are welcome. Each basket is valued at approximately $450! Buy a ticket for either basket for $5 or both for $8! !